Welcome to Crystal's Royal Secrets: Extraordinary hair and body products for the entire family. You just have to try it to believe it! Crystal Devin, of African-American and Native-American descent, used her personal knowledge and study of herbology to formulate an extraordinary line of natural products. Inspired by nature, her goal is to offer safe and effective personal care products to those seeking the benefits earth has to offer. These products are designed to address a variety of problems such as hair loss, dry scalp and damage due to over processed and colored hair. Only the finest olive oil and castor oil, in conjunction with the finest herbs from all over the world that complement and balance each other, are used to produce extraordinary results. Extraordinary products for the entire family! Many people have scalp problems. Hair may be thinning, falling out, breaking off, or growing slowly. This product is designed to be used in those areas where it is difficult to grow hair. 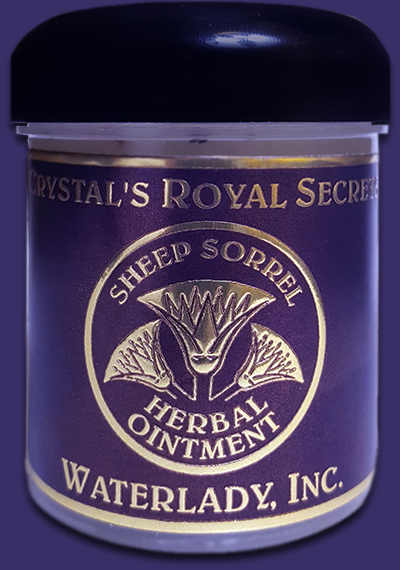 Simply massage the Sheep Sorrel Ointment in daily until the desired results are obtained. This wonderful oil can be applied on your hair as a daily hair dressing, or as a deep nourishing scalp treatment. Apply a small amount directly onto the scalp while your hair is wet or dry. Then place a heating cap on your head for 30 minutes, or a plastic cap for 60 minutes or longer. Your scalp and hair will thank you for this kind attention. Results will vary with each individual. Diet, stress and medication are factors affecting results. Consistent use produces the greatest benefits. 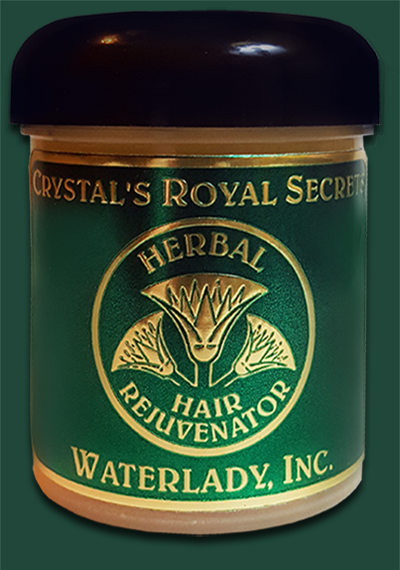 Sampling of Herbs used in Crystal's Royal Secrets: Jaborandi (stimulates hair growth), Maidenhair Fern (stimulates hair growth), Nettle (aids growth and conditions), Burdock Root (cleanser), Walnut Leaves (strengthens hair), Sage (growths hair and helps with dandruff), Rosemary (makes hair luxurious). Crystal personally supervises the entire process to ensure the highest quality. Her products have been featured in leading newspapers, magazines and online articles.